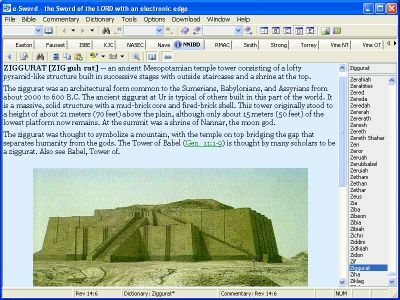 Comprehensive, Up-to-Date, and Illustrated Bible Dictionary for e-Sword! NOTE: This resource requires e-Sword v.10.1 or higher. Drawing from the expertise of some of the world's finest evangelical scholars, this updated and accurate full-color Bible Dictionary contains a wealth of the most dependable findings and insights to enrich your study of the Bible. Whether you want help for personal study or resources for teaching, you'll find fascinating and up-do-date information on over 7,000 entries that cover biblical people, things, places, themes, doctrines, and much more. Over 500 full-color illustrations and photographs, plus maps, charts, and more, make this a wonderful resource to browse through, as well as a dependable study tool. It features cross-references to six major Bible translations. Written in plain language with profound scholarship, Nelson's New Illustrated Bible Dictionary focuses on the practical aspects of biblical subjects. It enables a teacher or general Bible reader to do authoritative research on thousands of persons, places, things, and doctrines in the Bible. Ronald F. Youngblood is the Professor of Old Testament and Hebrew at Bethel Theological Seminary West in San Diego, CA. Good dictionary for the first steps and short summaries. Avoids controversial theses. The free “Cyclopedia” provides more comprehensive information (the articles are longer there). Very good book for study. I enjoy it. I look forward to using this illustrated dictionary. I have no regrets making this purchase. A lot of great information in this book. Articles are sufficient to inform but do not drag on to long. This is my go to source when studying a name or place I am not totally familiar with. Great book, I have it in hard back but was very appreciative to see it come to E-Sword. Yes, this is a great module. I live in China where the availability of products for one to study the word of God is VERY limited, as always I find the sources for e-sword to be of the greatest importance. If you're reading this comment please think about how fortunate you may be to live in a country where you can access the word of God without restrictions. this is an excellent addition to my E-Sword collection. It has good information on many different topics. This helps in my understanding of Bible topics and Bible life. I love this reference book. I have a hard copy also in my library. I find myself using this book to help further my knowledge on different studies that I like to do. I also love the colored picture references. It brings to life many of the things that I am researching or just reading for relaxation. This book and program are a excellent resource to help newer believers to gain depth and substance to God's word the bible. A illustrated dictionary is so much more helpful in Bible study. I am blessed to have this resource in my electronic library of study material. Nelson's New Illustrated Bible Dictionary for e-Sword is an excellent product, I'm looking forward to using it often. I have found it to be very helpful and very enlightning with it great pictures and descriptions. The Dictionary is very usable and contains significant information on the Bible. Especially noteworthy is the Bible Version section. This is a great addition to E-Sowrd! What a privilege to have such a vast source of information and knowledge available electronically and available by the click of n button. Much helpful to assist in word/places and Scripture studies also during preparation of presentations and sermons. Thank you so much for making this possible adn available through E-Sword. Excellent resource. I have use the hard copy for years and thankful that I can have on hand at all time. The bundle is a blessing. I can even travel with now. I first encountered Nelson's Illustrated Bible Dictionary as a bible college student working in a summer sales internship for Nelson's Varsity division in 1992. We sold educational books and Nelson's "New Open Bible," but I was given an order sheet and on a complete whim ordered a copy of their Bible dictionary to look over, rationalizing my use of my credit account that I would sell it to a customer in my door-to-door sales. I'd seen plenty of other Bible dictionaries in my previous four years at two Bible colleges, but had never seen this one in the libraries of either of my alma maters. However, as I continued to refer to it, I became convinced that if I ever did wind up selling it, I'd buy another copy...sounds like a young man's good intentions, right? Luckily, I never sold it, and so took it with me into my final year, through graduation, and beyond--and so I was blessed to use it over the next two decades on many lessons and for occasional sermon preparation. While I commonly checked out other resources, time and again, it was this dictionary that "rang true" and made it to my listener's ears--and hopefully into their hearts, as it did mine! Two decades later, I was able to pick up the "New" and revised version on software, which accomplished two things: First, it freed me to quickly insert the most trustworthy, solid, mature, and reliable bible dictionary text I've ever encountered quickly into my work with simple copy & paste--I'm a good typist, but the awkward and tedious transcription process is often fraught with errors--especially when deskspace is limited and bookholders for dictionaries are hard to find! Secondly, it allowed me to pass my cherished hardcopy to a friend and brother who already owned "The Nelson Study Bible" (which I also recommend) and felt the same affection for their mature Christian scholarship as I. If you can only afford one good Bible dictionary, this is the one I recommend. If you can afford a second or third, you'll probably do the same thing I do, and after referring to the others, find again and again that Nelson's Bible dictionary gets you there quicker and gives you more dependable insight to bless others with. Good essential information from important Bible words. With Bible-believing perspective. I like the amount of historical information given in this dictionary. I can be on a subject and right there get a background with illustrations. I haven't used it much but when I have it provides the understanding needed. Was excited when this excellent resource became available with illustrations, thanks to the image rendering feature added with e-Sword v10 - thank you Rick and module developer! The module is actually two files, a dctx file for the word indexed dictionary as one would expect, and also a mapx file, where 9 maps can be viewed separately in the graphics viewer. This is an optimum design which I like very much, allowing a map to be referenced while studying the dictionary or other resources at the same time. However, I have discovered some quality problems in the module, that are particularly unexpected and disappointing to find in a premium module which has been purchased. Firstly, in looking through to see how images are displayed in the dictionary, since only selected word definitions include images, I came across an image obviously indexed incorrectly. Under the word "Abronah" there is an image referring to Absalom's Tomb, which has nothing to do with that word, but should instead be under one of the following two words, "Absalom" or "Absaloms's Monument". I wonder if there are other instances like that. Secondly, in viewing the map images, low resolution makes it difficult to read text labels like names of places, especially if zoomed beyond 100%. If these deficiencies are corrected in a future update, this module would instantly increase to a 5 Star rating from me. Very nice format and is very informative. I am very happy in selecting and bying this wonderful book! I teach adult Bible study and e-sword is my primary source for lesson preparation. I am not very computer savvy, but e-sword is easy to use, even for an old timer like me. My latest addition, "Nelson's New Illustrated Bible Dictionary", has enabled me to make my lessons more interesting by providing interesting details to my presentations. I teach an adult Sunday School Class and I find e-Sword very easy to use and I an amazed at the resources that integrate into the program. I have not had a lot of time to use the dictionary, I expect it will work as good as all the other resources that I have added to the system. God does use technology to spread the good news and help make the gospel personal. Just updating my "Keys" and am starting to realize the wonderful service eStudySource is providing us through your "taking E-Sword" seriously. I guess that you are aware that if you submit a resource I will buy it, as you have been well doing... sure appreciate it. May God bless your work along with Rick's endevers. If you ever submit to us the "New Treasury of Bible Knowledge" - I would certainly have that as well, but in the meantime... I'm sure enjoying your hard work in making the Bible more meaninful to us all! The articles are informative and useful. The graphics come in handy for Power Point Presentations. For the special price it was hard to beat. NEVER ORDERED ANYTHING FROM YOU THAT I WAS NOT WELL PLEASED--THANKS SO MUCH FOR ALL YOU DO. TRYING TO HELP GET THE WORD OUT ABOUT YOU AND YOUR WORK TO HELP US CHRISTIANS AND PREACHERS. The Nelson's New Illustrated Bible Dictionary is a must for anyone who is serious about studying God's Word. This dictionary is a very helpful tool in explaining and helping readers understand certain words, places, life styles, etc in the Bible. This dictionary is very useful with Bible commentaries or when simply reading the Bible. When you come across a word or thing that you do not really understand at the time, this dictionary will help clarify and answer your questions. I am always looking for study aids. This Dictionary from Nelson mets and exceeds my expectations. I could not pass up on this excellent value. Thanks for e-sword. I believe its appearance on the globe was divine. Its one of the best libraries in the world that has ever been created. Its easy to use very fast in searching. Its one of the best Bible powered engines ever made. Amazing it cost nothing to abtain it unlike other programs that is very expensive to obtain. Its absolutely free. The Nelson's New Illustrated Bible Dictionary is also one of the finest material on my computer library. It contains a well of rich ingredients that is needed today for the body of Christ. I will personelly recommend it for every Christian especially leaders and preachers alike. I appreciated the full descriptions and photographs, some in color. The tables and charts are easily copied for insertion in lesson plans. I used the hardback copy for many years and find this digital version a welcome addition to my digital library. This is a fabulous online tome and provides in-depth insights with magnificent graphical display that will tantalise the most astute and demanding student. Thoroughly recommended! Like all the products I have bought for my eSword program I find it to be of very high standard and easy to use. The Entire package is Great, easy to read and understanding along with the software, very user friendly, u couldn't really ask for more especially with that price, you can see the seller probably looking a contribution so to enhance with the ministry not to get rich out of this material, with that cheap price. Thx a lot God bless you all.